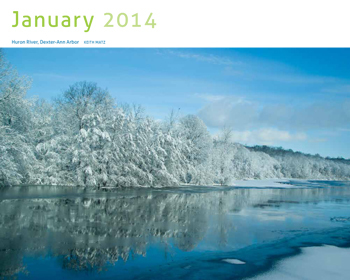 The communities of the Huron River watershed have come together to produce another spectacular calendar. Chock full of stunning Huron River photography, stormwater pollution prevention tips and local resources, this year’s version features 15 of your neighbors who are doing their part to protect water quality in their everyday actions! Your mission if you choose to accept it is to become an H2O Hero yourself. Pick a sidekick, choose your color, select hero gear and decide which “bad guys” you will fight. 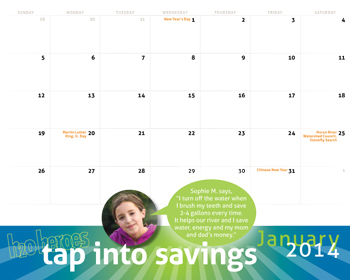 You can get your hero on in seven easy steps — check the hero handbook that starts on page 28 of the calendar. Once you’ve done it, “like” HRWC on Facebook and update us with your hero name (clever or not). 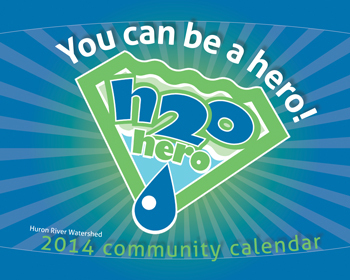 We’ll enter you to win one of 50 H2O Hero t-shirts that we’ll give away in January. How to get your calendar. By mail. City of Ann Arbor, City of Brighton and Village of Dexter are direct-mailing to most households in their communities the week of November 4th. From HRWC. Contact Pam Labadie at plabadie@hrwc.org or (734)769-5123 x 602. We can mail a calendar to you for $5 or you can pick one up for free at HRWC. The 2014 Watershed Community Calendar is a collaborative effort to educate residents about the importance of water stewardship and nonpoint source pollution prevention.  The communities listed above believe there are substantial benefits that can be derived by joining together and cooperatively managing the rivers, lakes, and streams within the watershed and in providing mutual assistance in meeting state water discharge permit requirements. HRWC would like to thank them for their continued support of the calendar program.